Hi there, I've watched your videos on how to clear a cloudy pool, I've shocked my pool, added chlorine, put algaecide in at opening and clarifier twice and still not clear. It's been about 3 weeks. Mind you, it has been crappy weather and raining a lot which I know affects the water. My pool is 16x32ft and goes 3ft-6ft into deep end. 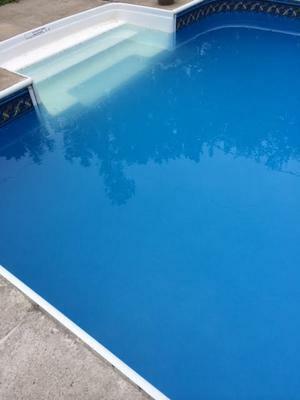 I can see the steps and shallow end bottom as well as the sides of the pool, but can not see the deep end at all or the drain. It's almost a cloudy clear color, like it wants to clear up but just can't get there. This mornings readings were chlorine-3.0, pH 7.8, alkalinity 110-120ppm. I don't have the CYA test on my kit. We have an older Jacuzzi Brand Laser Sand filter with a Hayward pump. First is you need to know the CYA. That's one of the most important readings. The stabilizer dictates the FC efficiency. The normal CYA range is 30 - 50ppm. Anything <20ppm and you simply need to add some CYA to get it to 30ppm. Anything >60 - 70ppm would require a partial drain and refill. Too high or low and the FC becomes much less active. Once you have the CYA at 30ppm you'll need to drop the pH down to 7.0 - 7.2. Use 12 oz. of acid to lower the pH 0.2 per 10k gallons. I'd start with about 50 oz. around the perimeter, sweep well, filter for 8 hours, then retest and make another adjustment if needed. The FC works better at a slightly lower pH. Be sure you filter is working perfectly. Next is to vacuum as best you can, then backwash. Sweep the walls very well. 20k gallons. Is that right? If so you'll use 2.5 gallons of chlorine. Shocking is a process, not an event. The trick is to get AND keep the chlorine above 10 - 12ppm for a period of time. You'll need to manually dose the pool with chlorine to keep it at 10 - 12ppm. Make the adjustment at night, then retest in the morning. Be sure to have the pump running 24/7 and backwash once per day. You can go up to 15ppm, but no higher. Anything after that and you're wasting money and chemicals. You must maintain the FC level at 12ppm or a bit higher. Cloudy water is normally the first sign of an algae bloom. No need for clarifiers at this time. You can use an algaecide but ONLY use a PolyQuat 60 during this process but never a copper algaecide. Once the FC holds at 10 - 12ppm between applications you can use a clarifier to help with the filtration. Be sure the skimmer and pump baskets are cleaned out. I did brush the pool today and I had a gallon of chlorine left so I put that in (I know it's not enough but all I have until tomorrow). My husband says it's because when we opened it, I didn't add enough chlorine to kill it all so we are making up time for not adding enough chlorine. I don't see any algae in the pool but I will look for a PolyQuat one. Thanks again! I will keep you posted.